In addition to his role as Registrar of the DIFC Courts, Mark is a Judge of the Courts’ Small Claims Tribunal, Chairman of the Courts’ Users’ Committee, a Member of the Rules Subcommittee and Registrar of the Special Tribunal Related to Dubai World. In 2010 Mark was appointed for a year’s term as a Member of the World Economic Forum’s Global Agenda Council on the International Legal System and he is Vice-President of the Middle East for the International Association for Court Administration. Under Mark’s direction, the Courts have secured a reputation as one of the most efficient and advanced commercial courts in the world. He has overseen the launch of various firsts for the Middle East, including a Code of Professional Conduct, a Pro Bono programme, a common law training academy and a Wills and Probate Registry. He has played a key role in the development of the Courts’ many formalised relationships with partner judicial systems in the region and beyond. 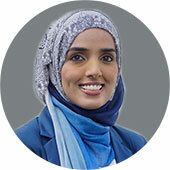 Amna joined the DIFC Courts in 2006 and became the Chief Executive and Registrar in 2017 and Deputy Chief Executive of the Dispute Resolution Authority in 2014. Previous to her employment at the DIFC Courts, she practiced as a lawyer in the litigation department with Hadef Al Dhahiri and Associates. In addition to her role as Chief Executive and Registrar of DIFC Courts Amna is also Registrar of the Special Tribunal Related to Dubai World, Chairwoman of the DIFC Courts’ Users’ Committee and a member of the Consulting Council for the University of Sharjah College of Law. 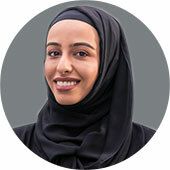 In 2014, after an extensive selection process Amna was selected to join the Mohammed Bin Rashid Centre for Leadership Development – the Young Leaders category and in the same year, appointed to the Advisory Board of the International Bar Association’s Access to Justice and Legal Aid Committee. Amna has played a key part in the establishment and development of the DIFC Courts and creation of the Dispute Resolution Authority in 2014. She also spearheaded the establishment of the DIFC Courts’ Pro Bono Programme, launched in 2009, which is the first scheme of its kind in the Middle East. In 2011 Amna was recognised by the International Bar Association as one of the Top 3 young lawyers in the world and was listed in the Top 50 Most Influential Women in the Arab World by Arabian Business in 2018. Reem began her career in Human Resources with the DIFC Authority andjoined the DIFC Courts in January 2011 as the Head of Human Resourcesand Business Excellence. In 2013, under Reem’s direction and as a resultof DIFC Courtscommitment to court excellence, DIFC Courts became thefirst court in the world to achieve the International Standard forService Excellence (TISSE) certification. In 2014 the DIFC Courts, led by Reem, attained the 5 Star CustomerExcellence Award by the UAE Prime Minister -the first non-federal UAEgovernment entity to do so. In the same year, she became the ChiefOperating Officeroverseeing all the operational departments supportingthe divisions which make up the DRA. Following hersuccess in 2015, Reemgraduated from the Mohammed Bin Rashid Centre for Leadership Development. In 2016, Reem became the _ICCE Representative for DIFC Courts and Memberof the Executive Committee_ following the DIFC Courts proudly becoming amember of the International Consortium for Court Excellence (ICCE),becoming one of the premier league of courts working actively to assist judiciaries across the world to adopt the International Framework for Court Excellence. 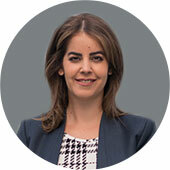 Nour Hineidi Kirk was appointed as Deputy Registrar of the DIFC Courts in February 2018. Natasha joined the DIFC Courts in February 2012 as Judicial Clerk and was appointed Assistant Registrar in November that year. Natasha also began hearing cases as a Small Claims Tribunal Judge in May 2016. She is responsible for reviewing the judicial output of the Court, as well as preparing Practice & Registrar Directions and amendments to the Rules of Court. 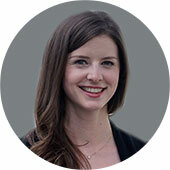 Natasha is the main person responsible for the development of Memoranda of Guidance and the advancement of the Courts’ relationship with fellow commercial courts in other jurisdictions. She established the DIFC Courts Academy course in 2012, in conjunction with Thomson Reuters, and helped to draft the Courts’ Code of Conduct – among the first Codes of Ethics for lawyers in the region, and now examines complaints lodged against Practitioners under the Code. Natasha also co-wrote and updates the Courts’ Enforcement Guide, which sets out the legal framework governing the enforcement of DIFC Courts judgments and orders outside the DIFC. Natasha was called to the Bar of England and Wales in 2006. She has an LLB from the University of London (2001) and an LLM Masters in Public International Law from the London School of Economics (2003). Natasha comes to the Courts after five years with the European Court of Human Rights in Strasbourg. Mariam Deen joined the DIFC Courts in February 2016 as Judicial Clerk and was appointed as a Judge of the Small Claims Tribunal (SCT) in October of the same year. Mariam is an accredited mediator of the Royal Institute of Chartered Surveyors (RICS) and provides mediation in SCT cases in addition to presiding over SCT Hearings. She is responsible for advising on and drafting Judgments on behalf of the resident Judges of the DIFC Courts’ Court of First Instance and Court of Appeal as well as reviewing all aspects of the judicial output of the DIFC Courts. Mariam is on the Academy of Law’s Editorial Board and also contributes quarterly articles for the Dubai Judicial Institute’s ‘Emirates Law, Business and Practice Magazine’. Mariam was called to the Bar of England and Wales in 2008. She has an LLB from Queen Mary University of London (2007) and completed an LLM Masters module in Shariah Law at SOAS University of London (the School of Oriental and African Studies). She has a broad range of experience which includes time as an In House Legal Advocate for the Crown Prosecution Service of England Wales, for which she prosecuted criminal cases in the Courts and acted as In House Legal Counsel for Louis Dreyfus Commodities, a large multinational organisation for which she advised on all aspects of commercial and corporate matters. 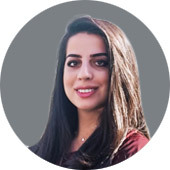 Hajar joined the DIFC Courts in 2018 as a Case Progression Officer. 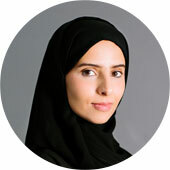 Prior to joining the DIFC Courts, Hajar was positioned as a Paralegal and Legal Consultant. Hajar is responsible for the day-to-day management of claims filed in the Court of First Instance, Court of Appeal and the Enforcement department. She also supports the Registry with functions related to the Small Claims Tribunal. Ayesha joined the DIFC Courts in the role of case progression officer in March 2015 and was promoted to the role of Assistant Registrar in 2018. She currently oversees the progression of Court of First Instance, Court of Appeal and Enforcement cases. She provides support to the Registry in its day-to-day functions. Hayley joined the DIFC Courts in October 2013 and served the position of Registrar’s Associate, working with the Registrar and Deputy Registrar, before moving into the Small Claims Tribunal as Case Progression Officer in early 2017. Hayley’s main roles involve managing the cases and liaising with the parties to progress the cases in the SCT. Prior to moving to Dubai, she worked as a clerk to The Hon. Justice Eder at the Royal Courts of Justice in the UK and served as a caseworker for the Crown Prosecution Service. She has completed her law degree (LLB) from the University of Southampton. Abdalla has joined as Case Progression Officer and Bailiff at the DIFC Courts in 2018. 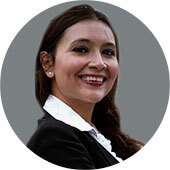 Abdalla has over five years of legal experience in the UAE. Abdalla is responsible for day-to-day management of claims filed in the Court of First Instance, Court of Appeal and the Enforcement department. He also supports the SCT Registry as required.